Doom metal has a legion of followers quite unlike many other genres. The slower tempos and riffing within the music and the emotional outpouring speaks to the musicians and the people who follow it in a myriad of different ways. Comforting to some, cathartic to others, channeling to depths that can be hard to put into words. Massachusetts trio Benthic Realm consists of members with decades of experience playing in bands within this genre – coming together and releasing two EP’s in two years, including their latest effort We Will Not Bow. 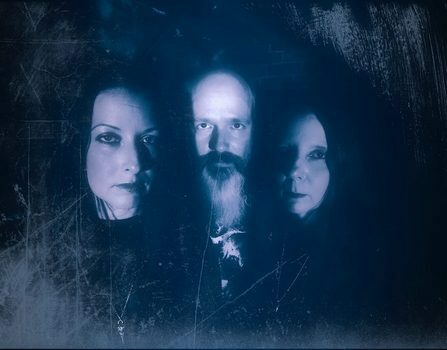 Throwing the occasional extreme curveball with blackened screams during the conclusion of “Save Us All”, the trio embrace the despair and power of doom metal throughout, without forsaking the melodies and catchiness that appear inherent in Benthic Realm’s compositions. Seeking the need to learn more about the group, we engaged in a conversation after a band rehearsal with vocalist/guitarist Krista Van Guilder, bassist Maureen Murphy, and drummer Dan Blomquist. This conversation covers the drummer change, the quick recording and execution of their newest EP, thoughts on the New England metal scene, and how the band will approach output going into the future among other topics. Dead Rhetoric: Your latest EP release is We Will Not Bow – the first with current drummer Dan Blomquist. Where do you see the evolution of the band from your debut, self-titled EP to this release? Krista Van Guilder: That’s a good question. A lot of the songs on this EP, and we were just talking about this earlier, they were written when Brian our old drummer was still in the band. The only song that was new to all three of us in the band with Dan was “Save Us All”. Before that Brian had been with us, so Dan obviously decided to put his own spin on things – (staying) pretty true to what Brian had been playing. Dead Rhetoric: What exactly happened to necessitate the lineup change with Brian leaving and Dan joining? Van Guilder: Brian moved to Los Angeles. It was plain and simple. He and his wife were looking for a warmer climate. He was really sad to leave. We were happy for them that they were going to start a new life out in California. They recently moved to back to New England though (laughs). We end up finding out that a lot of people that leave end up for some reason coming back. We were super pumped when Dan reached out to us, he got the feelers out about what our plans were. There was very little down time between the two drummers- we actually played a show with Brian on a Friday night out in western Mass. And the very next night we played with Dan in Boson at O’Brien’s. We rung out the old with the new. Dead Rhetoric: Considering the seasoning of the band members performing and playing in numerous metal acts – especially within the doom genre – do you believe this puts you at an advantage as far as developing and honing the specific qualities that make Benthic Realm distinct from other acts you’ve previously been involved in? Van Guilder: Oh, definitely. It’s hard to get away from everything that influences you or your natural style of playing. For myself, I’ve noticed that every time I’ve worked with different people, my style is always there- it’s pretty prominent. It always turns into a little twist to it, depending on who I’m playing with. Depending on the styles of the people I’m working with. We have a lot of varied influences based on what we personally grew up listening to and our preferences, it helps for Benthic Realm to stick apart because of this. We do blend together many different genres together. Dead Rhetoric: And Dan, how is it performing in two different bands like Conclave and Benthic Realm, because both have some stylistically similarities even though they are in the same sub-genre of doom metal? Blomquist: I love it. They are definitely the same but different. A little different vibe between the two bands- they are both great, but in different ways. The writing process is different in both bands as well. I couldn’t be happier to be playing in both bands. I’m very grateful man. Dead Rhetoric: What’s most appealing to you regarding the power trio format? Did you take into consideration adding a second guitarist at any point, or are you content remaining a three-piece? Van Guilder: For the time being, I’m pretty content with being a three-piece. Second Grave had started from pretty much the beginning as a two-guitarist lineup. It was awesome, we wrote all the songs specifically for the two guitars. Chris had left the band before Second Grave had completely disbanded – we had tried it a bit as a three-piece and it was pretty difficult. When we decided to go our separate ways, I thought we would do a stripped-down thing with myself just singing and playing guitar, it would be fine. I have done this before, Lucubro started with two guitarists and then went down to one- and in Warhorse there was always one guitar player. The one guitar player thing can work, especially with a trio. I like the stripped-down thing more, and we can always experiment more in the studio if we want to. Live, Maureen does a really good job of rounding out that bottom end, so that it sounds quite a bit more full. Whenever you introduce somebody else into the mix, you got to make sure musically that you can play with them but also personality-wise. As much as I love playing with Chris, he is my husband- and it was a little bit weird to play with your spouse and keep things separate band-wise from your personal marriage. Blomquist: You also end up with more heads, more opinions, it can make things more difficult to work through some of the differences. With the three of us, it’s nice. Dead Rhetoric: You introduce some new elements on this EP- including some blackened style screams for the first song “Save Us All”. How did this come about? Van Guilder: It’s just always been there. I never want to out do it. I was in Obsidian Halo a long time ago, and we envisioned that with death metal growls, screaming – I like the variety. But I don’t want to overdo things where it’s just one thing or the other. It just so happened that there was this epic part in that song, and I felt it needs this. When I write stuff, I try really hard to play to the needs of the song. I don’t want to force things just to force them. There may be more of these parts – but I wouldn’t say we are going to switch over to death metal vocals all the time. I like the melodies, and there will be pieces here and there sprinkled about. Dead Rhetoric: As far as the lyrics, is it a challenge to come up with material that fits being the guitarist and a singer in this band? Van Guilder: No. I’ve fortunately been always able to do both. For me, it just feels natural. Sometimes I write something that’s a little more complicated that may take me a couple of extra run-throughs to get it right, but for the most part they go hand in hand. If I don’t have a guitar in my hands and I’m just singing, I don’t know what to do with my hands. (laughs). It’s not a problem- being able to do both I try to write my lyrics and my melodies around what fits with the guitar riffs I’m writing. I know my limitations and what I’m capable of doing, a lot of times the stuff writes itself. Dead Rhetoric: How do you define success for Benthic Realm? Are there specific goals that you want to accomplish, or are you content continuing things at your own DIY pace given the balance necessary between careers and families? Van Guilder: Definitely there is that balance between career and family and the band. We are all a lot older now – we are doing this at this point because we love to get together, we like each other as people, we love the music that we are playing and we have a lot of fun together. That’s pretty much it. That’s one of the reasons a lot of the bands in the past that I’ve played in have fizzled out- it stops being fun and starts becoming work. You aren’t making any money doing this- you do this because you want to make and listen to some cool music, your friends like it too – but in a sense it’s a selfish, creative outlet. Success for us is continuing to plug away and write songs. That’s my favorite part of this – to come down to this jam space and work on something new. The feeling that I get, a riff that I’ve written, everyone comes down here and starts adding their parts into a song, it’s just absolutely incredible. And to me that’s the most important part in all of this. I love recording in the studio – but playing a handful of shows here and there with friends, like we’ll be doing some festivals soon that will be a lot of fun. I don’t see us quitting our day jobs though and putting our houses up for sale. Dead Rhetoric: We are nearing the end of 2018 as we conduct this interview. What have been some of the standout releases for you to listen to and enjoy – in the metal genre or outside of it? Blomquist: I have two – the new Clamfight, it’s just awesome. The other end of the spectrum, I’m absolutely enamored with the new Churchburn – and they aren’t giant national acts or anything, but I think they both put out high quality material. Murphy: Ghost Ship Octavius, their new album is very cool. I loved their first one, and I’m excited to see Van Williams continuing to do material that is creative and heavy, while still melodic. Van Guilder: I have not much to add. I tend to just play my guitar and get too influenced by other stuff. I work, and I can’t listen to music when I’m working- it has to be instrumental, laid-back music. The Clamfight I picked up on vinyl, I love what they are doing. I was practicing constantly for the Lita Ford songs we did at the Halloween covers set at Ralph’s. I wish I had more time for listening to music. Murphy: Also check out Michael Abdow’s new solo album – it’s instrumental and he plays live with Fates Warning now. Dead Rhetoric: Being a part of the New England heavy music scene for such a long time, what qualities do you believe keep things healthy and thriving for musicians, fans, promoters, and venues to develop a win-win outlook in the end for all parties? Blomquist: I don’t think there is a very simple answer for that. Maureen Murphy: I will say the community aspect here is a lot different than in New York. There’s more of a feeling here of us all being in this together, it’s not about bands fighting with one other. It’s actually about cooperation and interest in one another – that’s a big part of what we’ve seen up here. Van Guilder: The majority of the people that are coming out to the shows, are musicians themselves. It’s a scene made up of musicians, and to (Maureen’s) point, there is friendship. We are sitting here in our jam space that we share with eight other people (laughs). Faces of Bayon is in our room, Desolate is in our room, Conclave is in our room. It’s definitely a big supportive group. Blomquist: We find that this extends out to the venues and promoters- there are good people and not that much of a competitive atmosphere. Van Guilder: A lot of the promoters around here are musicians themselves, so they know the deal around here. We are all sort of in this scene together – a lot of us have known each other for a really long time. Will that shift as we continue to get older and a new group of younger people come in and build up their scene? Will that be different- I can’t say. Murphy: We have so many different styles of heavy music up here- you end up meeting bands and people that are into power metal, traditional metal, it makes it a little different. 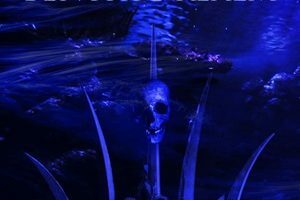 Dead Rhetoric: Do you foresee the next release for Benthic Realm being a full-length – or are you content to churn out EP’s on a more consistent basis? Is this a result you believe of the changing consumption models with digital media and streaming for the fans, where attention spans may be waning a bit compared to the older album-length model? Van Guilder: There are a couple of parts to this. I think people these days digest material quite a bit differently. People are used to singles and half an album. Keep in mind, we are a doom band- so we write pretty long songs. Back in the 80’s and early 90’s, full albums could be around a half an hour. It’s only four songs (the EP), but it has some length to it. There’s that aspect of it, and the other thing is- we are self-funded. Being in the studio, even for a full day, it’s not cheap. We were able to record this in one day – all four songs start to finish. All the music, all the vocals, and the mixing and mastering were done on separate days. But as a result, we saved a lot of money. In the future, perhaps. If we end up selling a ton of merch and have a good amount of money in the band fund – or if someone wants to give us money – we can consider a full-length. Back to the EP thing, I like the aspect of moving a little bit quicker. We write pretty fast as a band and we can release product much more quickly. And that keeps the listeners interested in us, we have something new that we are pushing on a fairly regularly basis. As I say that, we just started working on a new song in rehearsal right now. So who knows, maybe next summer we have enough tunes to record again, if that happens that’s what we will go do. Dead Rhetoric: Do you see any major differences between the studio and the stage for Benthic Realm? Do you have a preference of one over the other? Blomquist: I like both. I like the different aspects of both. I love the studio, I love the clarity and the transformation of the songs. But I love the live energy, the people more than anything. I work at home, so I don’t get a lot of social interaction – it’s great for me. I don’t want to play shows every day, but I do enjoy the socialization, being out there. Van Guilder: I love both as well. I absolutely love being in the studio because to Dan’s point, you really get to start to hear everything critically. It’s amazing to hear it with such clarity and in layers as it’s getting together. This uplifting thing happens and you get so psyched as each thing gets placed on top of one another. Live, playing to a packed house where everyone is super into it, you are nailing everything on stage – that’s awesome. The loading in your gear part, and then trying to get it on stage as quick as possible to get it off stage as quick as possible (laughs)- that part, not so much. We’ve learned to be efficient though. 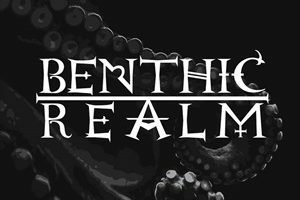 Dead Rhetoric: How do you see the next twelve months shaping up for Benthic Realm in terms of supporting the new release? Will there be any possible conceptual video or touring action taking place? Van Guilder: With the space that we are in, we have talked about doing a video. The room is pretty cool. Maybe at some point we will, it could be a lot of fun. Low budget- it will be us, constantly running around and adjusting the cameras (laughs). We are definitely a part of the Maryland doom festival next year, that has been announced. Warhorse is going to get back together for that as well. Starting to book some shows for next year – just relaxing the rest of this year for the holidays and family time. In terms of a tour, I don’t know – maybe we can do something in conjunction with the Maryland doom festival, something like that. It’s tricky having full-time jobs where you don’t get a ton of vacation time.